Way back in part 3, I briefly discussed the AWS CLI as a way to interact with the AWS platform. In this post, I want to spend a bit more time looking at the CLI, as once you start to become more comfortable with AWS, it’s likely that you’ll find the console a bit limiting - mastering the CLI will ultimately make it easier and faster for you when using the platform. Before I go any further, the first thing you need to do is actually install the CLI - the documentation explaining how to install the CLI on your local machine is available here. It’s easy to follow so I won’t duplicate it here. An error occurred (AuthorizationHeaderMalformed) when calling the ListBuckets operation: The authorization header is malformed; a non-empty Access Key (AKID) must be provided in the credential. As you can see, I’ve specified the ‘nocreds’ profile in the above S3 command, which - as you would expect - returns an error as that profile doesn’t contain any credentials. By default, the AWS CLI outputs everything in JSON format. Using JSON as the output makes it easy to filter using the –query parameter (desrcibed in the next section) or using other tools such as jq. However, there might be times when you want more of a ‘human readable’ format, such as a table or just plain text. You might find it easier to use the text output type if using Linux tools such as grep, sed, awk and so on. Taking the example in the section above - aws ec2 describe-instances, this potentially returns a lot of data, especially if you are running a lot of EC2 instances in your account. It’s highly likely that you are looking for more specific information - for example, you might be looking for the private IP address associated with one specific instance. Fortunately, this is easy to achieve through the use of CLI queries. Query strings use the JMESpath query specification. To demonstrate how it works, let’s look at some examples. In this example, I’ve searched for a specific instance ID in the first half of the query (using ?InstanceId==i-0f77eeba0d2835444) and then in the second half of the query I’ve asked for only the ‘PrivateIpAddress’ element to be returned. The AWS CLI has the ability to accept input from a file containing all of the parameters required, using the option –cli-input-json. However, it can be difficult to know which parameters you need and what they are called. To help with that, the CLI provides a way to generate a ‘skeleton’ set of parameters for a given command, which then allows you to fill it in and use it as input via the –cli-input-json option. Ok, that hopefully gives you a decent overview of the AWS CLI. Thanks for reading! In part 5, I talked briefly about the disk options available to you when running EC2 instances - you have the choice of using instance store based disks (i.e. a disk that is directly attached to the underlying host machine that your instance runs on), or to use an Elastic Block Store (EBS) based volume. Instance store disks are fine for temporary data storage, but aren’t a great choice for data that you want to be persistent - if the underlying host were to fail, or you happen to stop or terminate your instance, the data you have stored on the instance store based disk will be lost forever. If the thought of that upsets you, EBS based disks are the way to go. One of the key points about EBS is that a storage volume is not “tied” to a particular instance - it’s entirely possible to attach EBS volumes to any instance, as long as that instance sits in the same Availability Zone as the volume. So in other words, I could detach an EBS volume from an instance, destroy that instance and then re-attach the EBS volume to a new instance that I create later. EBS provides a number of different types of storage volume that differ in terms of both performance and cost. Let’s take a look at what’s on offer. SSD backed volumes: As the name implies, these volumes are all based on solid state drives and are the recommended option for many workload types. HDD backed volumes: Volumes based on hard disk drives (i.e. spinning disks) are recommended for throughput intensive workloads. General Purpose SSD (also known as ‘gp2’): This is a good choice for the majority of applications - it provides good level of performance, albeit potentially less ‘consistent’ than the io1 volume type (covered next). The key thing with gp2 volumes is that they provide a certain number of IOPS (I/O Operations per Second) based on the size of the disk. You don’t specify the number of IOPS directly, but instead get a certain level of ‘base performance’ depending on how large the disk is. You also get a certain amount of burst capacity based on a credit system - burst credits are replenished regularly and are consumed whenever you need more than the baseline performance. But of course, if you use up your credits, you are back down to the baseline performance level. Provisioned IOPS SSD (also known as ‘io1’): The difference between gp2 and io1 is that with io1, you are specifying a certain number of IOPS and the system will deliver it - there is no burst credit system as there is with gp2, therefore the number of IOPS you receive is potentially more consistent. As a result, io1 volumes tend to be used for workloads requiring higher IOPS or critical apps that require the more consistent performance. Throughput Optimised HDD (also known as ‘st1’): The first of the HDD offerings provides a relatively low cost volume type with decent throughput. This kind of vlume tends to be useful for big data workloads, log processing, or data warehouses. One thing to bear in mind with HDD volume types is that you cannot use them as boot volumes for EC2 instances. Cold HDD (also known as ‘sc1’): The sc1 volume type offers the lowest cost storage available within EBS. It is typically designed for data that isn’t all that frequently accessed, although still offers a reasonable level of throughput. Note also that there is a fifth type of volume called Magnetic (also known as ‘standard’) which is still available today, although this is considered to be part of the ‘previous generation’ of storage and generally speaking, shouldn’t be used for new apps. Of course, an easier way is to just create the volume as part of the EC2 instance creation, in which case you don’t need to worry about attaching it - that just happens automatically as part of the instance creation. 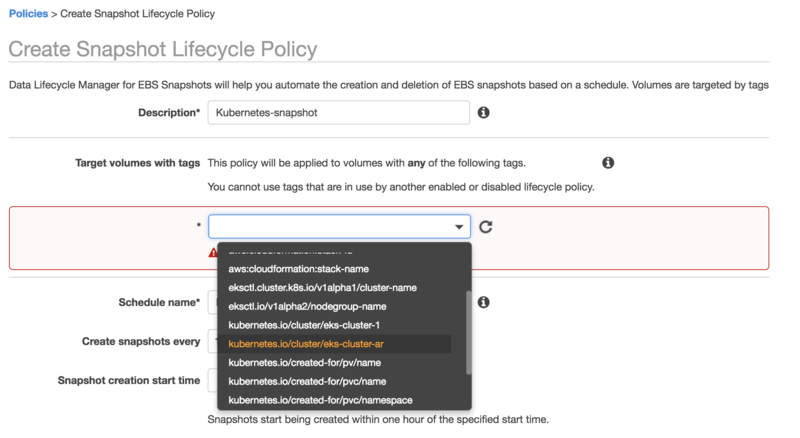 Now that we know how to create an EBS volume and use it from an EC2 instance, let’s look at how we can back up our volumes using Snapshots. An EBS snapshot is simply a point-in-time back up of the data blocks on an EBS volume. When you take an initial snapshot from an EBS volume, all blocks are copied from the volume to the snapshot - pretty straightforward. However, if you then decide to take subsequent snapshots from the same volume, only the data that has changed since the last snapshot are copied over. This is significant, because it means that a) data is not duplicated many times, which saves and storage costs and b) the time is takes to create the snapshots is greatly reduced. How does this actually work in practice? What actually happens is that when changed or new data is copied, a new snapshot is created and linked to the previous snapshot. You can read more about this process here. As you can see, this is very simple - you need to specify the volume that the snapshot will be taken from and optionally provide a description and tag. Now once you press the ‘Create’ button, you’ll see a state of ‘Pending’ under the snapshot item that results - what is actually happening here is that the data from the volume is being copied to the snapshot in the background. Depending on how large the volume is, that might take a few hours. Where is the data actually being stored? The snapshots themselves are all stored in S3. We could create a new EBS volume from the snapshot. The snapshot can be copied, including to other regions. You might want to do this for a number of reasons, including migrating instances to a different region, disaster recovery purposes, expanding to other geographies, etc. A new AMI (Amazon Machine Image) could be created from the snapshot for use when creating new EC2 instances. We can also share the snapshot with other AWS accounts. All of the above actions can be carried out from the ‘Actions’ menu within the snapshots area. Create a new volume from the snapshot. 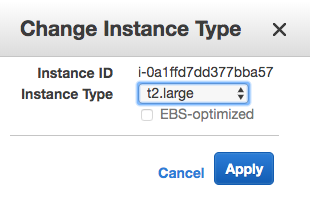 Attach the new volume to an EC2 instance and mount it. Access the files through the EC2 instance. For snapshots to be useful as a backup mechanism, there needs to be some way of scheduling snapshot creation automatically - it’s no use if you have to create a new snapshot manually every day. Fortunately there is a way to do this, using a feature called Data Lifecycle Manager (DLM). DLM can be accessed from the left hand menu of the EC2 area of the console. The primary method for identifying which volumes to back up is by using tags - for example, I could tag each of my volumes with a particular tag (say ‘snapshot:target’) and then configure DLM to look for all volumes with that particular tag and back them up. I then tell DLM how often to create the snapshots (every 12 or 24 hours) and the time I want the snapshot start time to be. OK, hopefully that gives you enough information about EBS to get going. See you next time! The Simple Storage Service (usually referred to as S3) was one of the earliest - and one of the best known - services available from AWS. But what exactly is it and what does it provide? At the most basic level, S3 provides users with the ability to store objects in the cloud and access them from anywhere in the world using a URL. What do I mean by ‘objects’? An object can be pretty much anything you like - files, images, videos, documents and so on. One of the defining characteristics of S3 is that for all practical purposes, it provides an unlimited amount of storage space in the cloud. Users of S3 pay only for the storage they use on a per Gb basis. There are also charges to retrieve data - these charges vary depending on which tier of storage you are using. Whereas S3 is designed for every day storage purposes, S3 Glacier(recently renamed from ‘Glacier’) is designed for long term storage and archival and is priced with this in mind (i.e. it is cheaper to store data). However, the trade-off is that retrieving data from S3 Glacier can take longer than with regular S3 storage, plus it is typically more expensive to perform those retrieval operations. Data durability refers to how likely it is that data will be subject to corruption or loss. AWS state that the S3 Standard, S3 Standard-IA and S3 Glacier tiers are designed for 99.999999999% durability. What that works out to is that if you store 10,000,000 objects in S3, you could expect to lose a single object once every 10,000 years. So, there’s still a chance, but I wouldn’t be losing any sleep over it. How do AWS achieve these levels of durability? A major factor is that data is stored on multiple devices across availability zones. So if I write an object to S3, that data is stored redundantly across multiple AZs (normally three) and a SUCCESS message is only returned once this has been done. There are other mechanisms in place to detect data corruption, such as MD5 checksums and CRC checks - all of this adds up to an extremely reliable system. To provide the maximum amount of flexibility, AWS provides a number of storage tiers, each with differences in pricing and capabilities (such as retrieval times). I’ll cover the tiers available at the time of writing, but be aware that AWS do occasionally add new storage tiers, so it’s worth checking the AWS documentation. Firstly, there is the S3 Standard tier. This is the ‘original’ S3 storage tier and is widely used for ‘general purpose’ storage. It is highly available (99.99% over a year) and resilient and tends to be the ‘default’ option when users need frequent access to their data. Secondly, there is the S3 Standard - Infrequent Access (S3 Standard-IA) tier. This tier is similar in many ways to the S3 Standard tier, however the main difference is that it is designed for data that needs to be less frequently accessed, therefore the per Gb storage costs are cheaper. However the trade-off is that it costs slightly more to retrieve that data. S3 Standard-IA is also designed for a slightly lower availability (99.9%) compared to S3 Standard. Next up is S3 Standard - One Zone Infrequent Access (S3 Standard-One Zone-IA). As you can probably guess from the name, the primary difference with this tier is that data is not copied across three availability zones as is the case with the previous two tiers we discussed. Because of that, availability drops slightly (to 99.5%), plus there is a very small risk that data could be lost in the event of an availability zone being destroyed. A more recent addition to the family is S3 - Intelligent Tiering. The idea behind this tier is that AWS will automatically move data between tiers on your behalf, with the goal of ensuring that your data is always kept in the most appropriate tier, cost wise. For example, if S3 notices that some data hasn’t been accessed for 30 days, it will automatically move that data into the Infrequent Access tier. If that data is accessed, S3 will move it back into the S3 Standard (frequent access) tier. S3 Glacier is the ‘original’ Glacier service, now brought into the main S3 family and designed for archiving of data. Glacier provides very cheap storage and different options for data retrieval, depending on how quickly you need to get that data back (costs differ accordingly). Announced at re:Invent 2018, S3 Glacier Deep Archive will provide the lowest cost storage option available from AWS - this tier is designed for data that needs to be retained on a longer term basis (for example, 10 years or longer). It offers an alternative to tape based storage systems, with retrieval times of up to 12 hours. Now that we’ve seen the different storage tiers available, let’s dive in and start to look at how S3 actually works. Notice in the above screenshot that I’m being asked for a bucket name - in this example, I’m calling it ‘araffe-testbucket’. I could have tried calling it simply ‘testbucket’, but that probably wouldn’t have worked - the reason for that is that S3 bucket names must be globally unique. By globally unique, I don’t just mean they need to be unique within your account - they have to be unique everywhere (i.e. the whole world). So if another user of S3 has taken the bucket name ‘testbucket’ (quite likely), I won’t be able to use it. It’s probably unlikely that someone else has used ‘araffe-testbucket’ though, so I should be safe with that one. 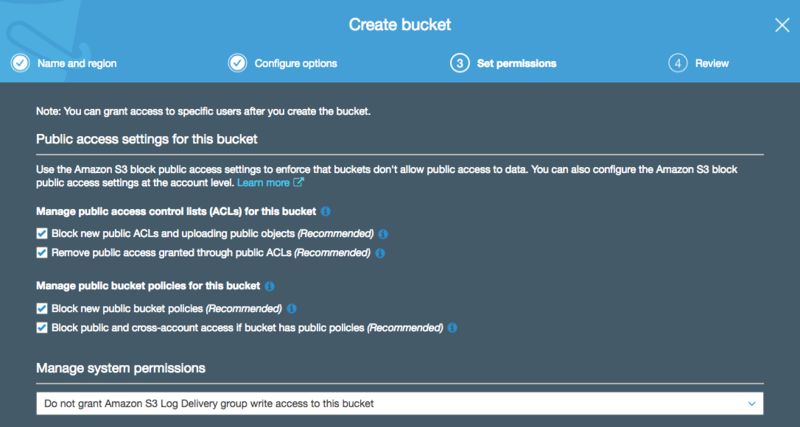 There are a number of other options you can configure while creating your bucket, some of which I’ll cover later. However, there is one important configuration item we should deal with now - public access to buckets. What this page is actually asking you is: “Do you want to prevent anyone from applying a policy that will make your bucket open to the public? Or would you prefer to untick these boxes and potentially allow access into your bucket from the entire universe?”. 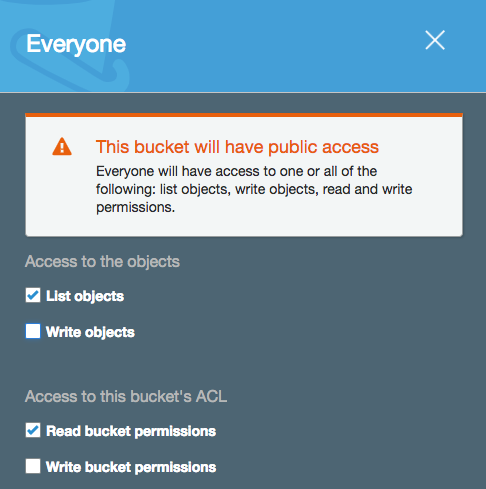 Public access to your bucket is exactly how it sounds - the ability for anyone in the world to access objects inside your S3 bucket. OK, there are a few use cases for this, but in general this is something you probably want to avoid doing. So, you can’t say you weren’t warned :-). In the Identity and Access Management (IAM) post, I mentioned that there were two types of policy - identity based and resource based (where a policy is applied directly to a resource rather than a principal). An S3 bucket policy is one example of a resource based policy and allows you to grant access to your S3 resources. Note that in order to apply this policy, I would first have to untick the option that blocks public access in the ‘public access settings’ dialog that we discussed in the section above. 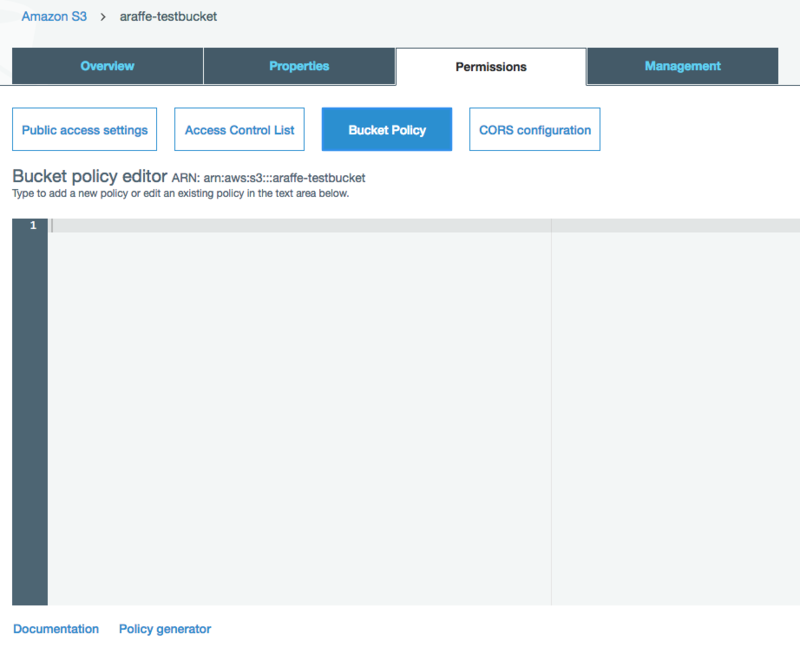 You might be thinking to yourself that the idea of writing these policies out by hand is a bit daunting - if that’s the case then have no fear, because at the bottom of the bucket policy editor screen (shown above), there is a link to a policy generator. This will guide you through the process of defining your policy using drop down boxes and then present you with the policy document at the end, which you can simply cut and paste into the bucket policy editor. OK, so you’ve created an S3 bucket. That’s very nice, but not all that useful unless you can actually get some data into that bucket and download it when you need to. Once you’ve chosen the files you want to upload, you can set permissions on them and choose which storage tier (Standard, Standard-IA, etc) the objects will use. To download objects using a browser, you can get the URL for any given object by checking the box next to it in the S3 management console - a box will open on the right hand side of the screen showing information about the object, including the URL for the object. If the person using the URL has permission, they will be able to download that object. If you aren’t a fan of graphical interfaces and would rather use a CLI based tool to move your data around, you can use the AWS CLI to copy data instead. You can see that the operation has succeeded by the output after the command has executed (you can also check using the management console of course). These are just simple examples - it’s worth checking out the documentation for full details on what you can do with the S3 command line. When you upload objects to S3, those objects are private, unless you have configured that to not be the case (which isn’t normally advisable). However, there will be times when you want to make objects available on an exception basis but still keep them private overall. Is that possible? It is, using pre-signed URLs. This command generates a URL that you can give to the person who needs access to your file - note that by default, this URL expires in 3600 seconds, although you can configure this expiration using the ‘–expires-in’ switch. Versioning in S3 allows you to keep multiple versions of the same object within a single S3 bucket. What that means in practice is that you can overwrite an object (like I did in my example), however the object will be created with a new version number, while the old version will remain in place. If I make a mistake, I can restore the previous version of the object and all will be fine with the world. Let’s see how this works. I can easily download either of the versions using the normal methods. If I want to, I can delete the latest version of the file, which will result in the older file being left in the bucket and still available for download. OK, but what if I want to recover my file? Simple: I just remove the delete marker - this restores the original object to the bucket. One thing to bear in mind when using versioning is the impact it may have on costs. As you are now potentially storing multiple versions of an object in your bucket, these are charged at the normal rates for the tier you are using. Finally, once versioning is enabled on a bucket, it cannot be disabled - only suspended. Suspending versioning on a bucket means that no new versions of objects will be created, however any existing object versions will be kept. At the beginning of this post, we discussed the various storage tiers available in S3 (Standard, Standard-IA, Standard-One Zone-IA, and so on). It’s of course perfectly fine in many cases to stick all of your objects into the Standard tier and be done - equally however, you may find that this isn’t the most cost effective strategy for storing your objects and that it’s better to store some objects in the ‘lower’ tiers. The problem is, how do you manage this if you have a huge amount of objects stored in S3? It’s not really feasible to manually move objects around between tiers. This is where the lifecycle management capabilities of S3 come in. 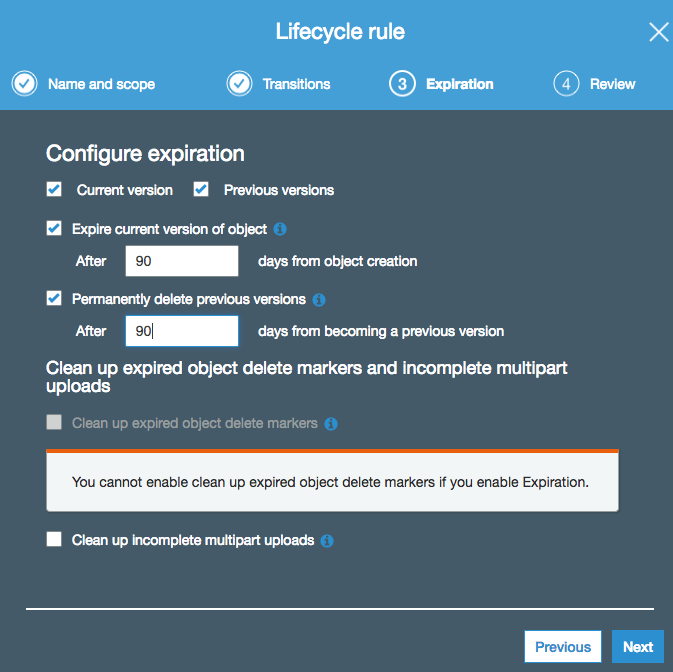 Lifecycle management allows you to specify a set of rules that state that objects are either moved between S3 tiers when certain conditions are met, or that the objects are deleted after reaching a particular expiration time. As an example, you might upload a set of documents that are accessed frequently for the first month, after which they are hardly ever accessed and therefore better suited to one of the infrequent access tiers. I could have selected any of the other storage tiers, such as intelligent tiering or S3 Glacier if I wanted to archive my objects after a certain amount of time. 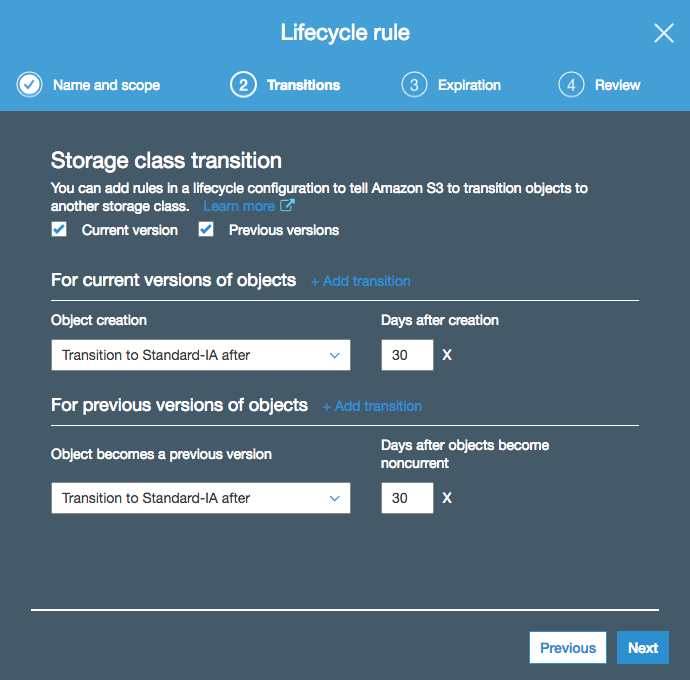 S3 also has a storage class analytics tool which looks at the storage access patterns for your bucket and helps you to decide which lifecycle policies you should configure, which storage class to transition to and so on. Under normal circumstances, any objects that you upload to an S3 bucket will stay within the region where that bucket was created - there are obvious reasons for this relating to compliance, etc. You certainly don’t want data to be moved into other regions without your knowledge. However, there are some situations where you might actually want your data to be copied to another region. For example, where customers reside in multiple geographic locations, you might want to maintain copies of data in two AWS regions that are geographically close to those customers. There might also be legitimate reasons relating to disaster recovery. 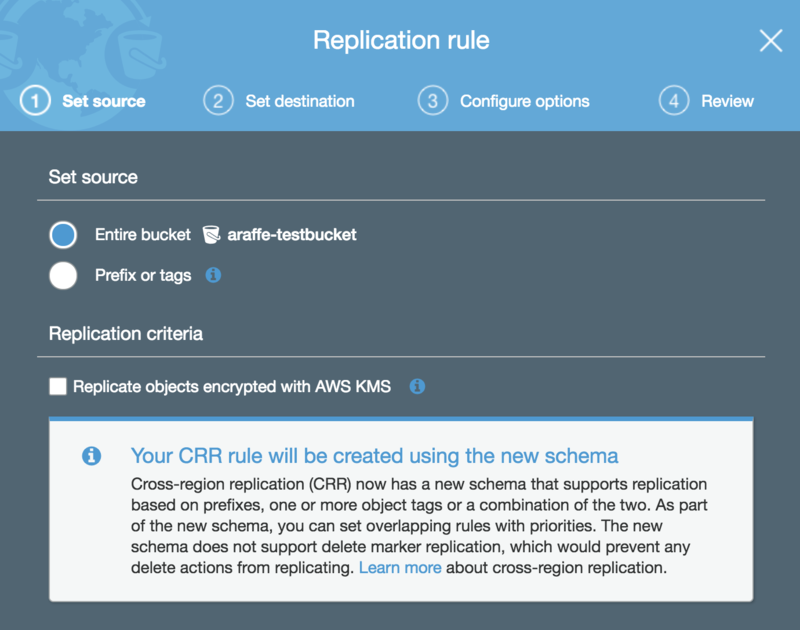 To support these use cases, AWS provides the ability to perform cross-region replication of objects in S3. 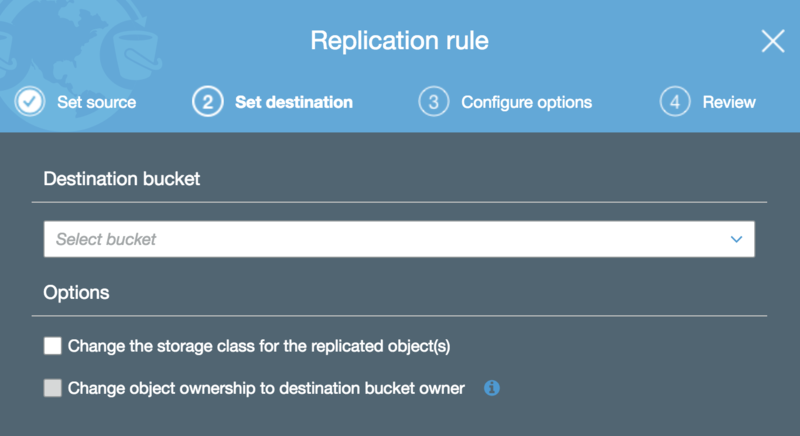 Only objects that you upload after enabling cross-region replication are copied. Any objects that existed before you enabled the feature are not replicated. By default, objects will be replicated using the same S3 storage class as the source object uses. So if your source object is stored in S3 Standard-IA (infrequent access), the replicated object will also be stored in the Standard-IA storage class. You can however specify a different storage class for the replicas should you wish. 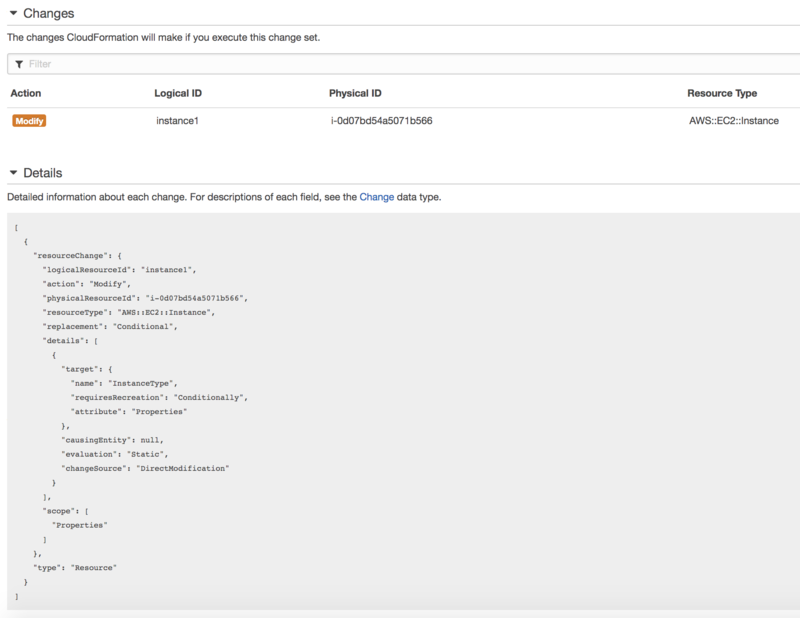 You can replicate objects between S3 buckets in different AWS accounts. You can replicate encrypted objects, although this is not the default - you have to tell S3 to do it. Note here that you can choose to replicate objects in the entire bucket, or you can replicate only objects with a particular tag or prefix (for example, any objects that have a name beginning with ‘photos’). Note that for cross-region replication to work, you must have versioning enabled (see section above). S3 provides the ability to encrypt the data residing in your buckets at rest. What does ‘at rest’ mean? It is simply the ability to encrypt the data while it resides on disks inside a data centre. The opposite of ‘at rest’ is ‘in transit’, where data is encrypted as it is transmitted from place to place. The first option you have is to use Server-side encryption with S3 managed keys (SSE-S3). Choosing this option essentially means that S3 manages the encryption keys for you - you don’t have to worry about any aspect of key management. You simply upload your objects to S3 and each object is encrypted using a unique key. Alternatively, you could go with Server-side encryption with KMS managed keys (SSE-KMS). KMS stands for Key Management Service - this is a service provided by AWS that allows you to create and manage encryption keys. So if you choose this option, your encryption keys will be managed within KMS, rather than directly within S3. What’s the difference? With KMS managed keys, you get some additional benefits over and above SSE-S3, such as the ability to create and manage the encryption keys yourself, as well as audit trails for the master key. Finally, you could choose Server-side encryption with customer managed keys (SSE-C). With this option, you are responsible for managing the encryption keys yourself - Amazon does not store any encryption keys. Instead, you pass the encryption key with the request and S3 uses that to encrypt or decrypt the data. Of course, as Amazon isn’t storing your encryption keys, you need to be careful not to lose them - if you do, you’ve lost your data! There is one more option not mentioned in the above list - you can of course encrypt the data yourself before you send it to S3. You can do that using either KMS managed keys or keys that you manage yourself - the key point is that S3 is not encrypting or decrypting anything as that is happening on the client side. That just about rounds things out for S3. There’s more to learn but this post covered the basics and should give you enough info to get going. Thanks for reading! Networking is an important topic in AWS. Many of the networking concepts in AWS are somewhat similar to what you might find in traditional, on-premises networks - IP addresses, subnets and routing tables don’t just disappear in the cloud! However, there are some differences as well, which I’ll try and cover in this post. Let’s jump in, starting with the most fundamental building block used in AWS networking: Virtual Private Clouds. A Virtual Private Cloud (VPC) is a private, isolated network within the AWS cloud. Within a VPC, you can run the services that you need, including EC2 instances, RDS instances, container clusters and a host of others. The key here is that VPCs are completely dedicated to you - there is no ‘sharing’ of VPCs with other customers or entities (unless you specifically want that to happen), which means you can be safe in the knowledge that services running inside your VPC are isolated from anything else on the AWS cloud, if that is your goal. 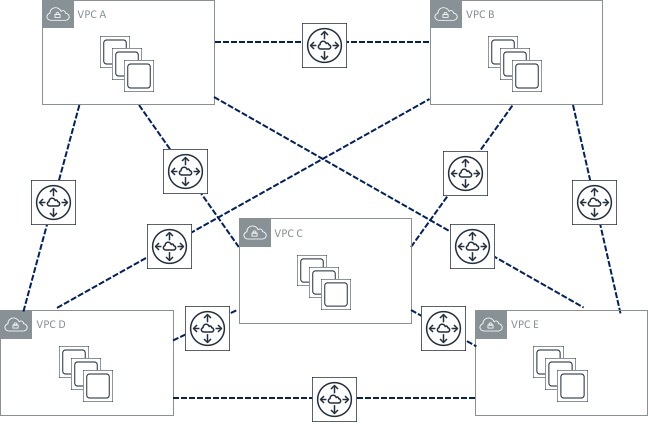 To deploy services into a VPC, you are going to need at least one subnet. Each subnet has a specific IP address range (taken from the main VPC CIDR block), so for example, the default VPC (as mentioned above) has a CIDR block of 172.31.0.0/16, with the first subnet using 172.31.0.0/20, the second subnet using 172.31.16.0/20 and so on. Obviously if you decide to create your own VPC, then you can address this as you like. It’s important to understand that a subnet cannot span AZs - it always sits entirely within a single AZ. Let’s look first at the Internet Gateway. The IGW is deployed and attached to the VPC itself - not to any particular subnet. However, any subnet has the ability to route through that IGW, which is exactly what Subnet 1 is doing. A route table has been created and attached to Subnet 1. Within that route table, there is a route towards 0.0.0.0/0 (this is known as a default route, as it essentially means “any traffic that doesn’t match any other routes should use this one”). The default route in this case points to the IGW as a next hop - this causes any traffic destined for the Internet to take the path towards the IGW, which is what makes Subnet 1 a “public” subnet. Now if you look at Subnet 2, there is no such route table pointing towards the IGW, which means there is no possible path that traffic can take out to the Internet - in other words, Subnet 2 is considered “private”. But simply making a subnet public doesn’t necessarily mean that traffic from its associated instances can automatically reach the Internet - for that to happen, we also need to consider the IP addressing within the subnet. 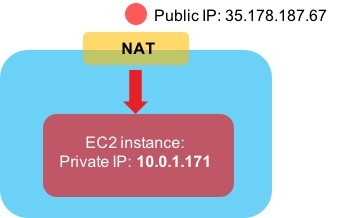 When you create an EC2 instance and attach it to a subnet & VPC, that instance will automatically receive a private IP address to allow it to communicate with other instances and services internally (or even to on-premises environments via a Direct Connect link or VPN connection). However, a public IP address will allow the instance to communicate out to - and be accessible from - the Internet. There are two types of public IP address. The first is a dynamically assigned public IP - this type of address is assigned to an instance from Amazon’s pool of public IPs. That address is not “owned” by you and it isn’t associated with your account - think of it as if you are “borrowing” the address from AWS. Now, there’s an important point to remember about public IP addresses: if you either stop or terminate the instance, the public IP address that is attached to that instance is released back into the pool. What that means in practice is that if you restart the instance, you are extremely unlikely to end up with the same public IP address you had previously. Is that an issue? Maybe, maybe not. In many cases, having a public IP address that could change won’t be a problem (e.g. if you are relying on DNS resolution), but what about if an application is hard coded to use a specific IP address, or if there is some kind of firewall rule in place that allows only a specific IP? In that case, you might want to look at Elastic IPs instead. An Elastic IP (EIP) is a public IP address that is associated with your AWS account and which you can assign to any of your instances. Because the EIP is associated only with your account, no other user of AWS will be able to use that address - it’s yours until you decide to “release” it, at which point it will go back into the pool. Elastic IPs solve the problems mentioned above - i.e. whitelisting / firewall rules, hard coding of addresses inside applications, etc. As of late 2018, it’s now even possible to bring your own address pool to your AWS account (as long as you can verify that you own it) and allocate Elastic IPs from that - this is known as Bring Your Own IP. Alright, enough about IP addresses - time to look at how routing works in AWS networking. In order to control how traffic flows in and out of the environments you create, every subnet is associated with a route table. A route table contains - believe it or not - one or more routes to control the flow of traffic. We’ve already seen earlier on that a default route (0.0.0.0/0) is often in place to direct traffic towards the Internet (via an Internet Gateway), but this isn’t the only type of route we can have. A route might point to a different type of gateway, such as a VPN gateway, a peering connection or VPC endpoint (we’ll look at these later). 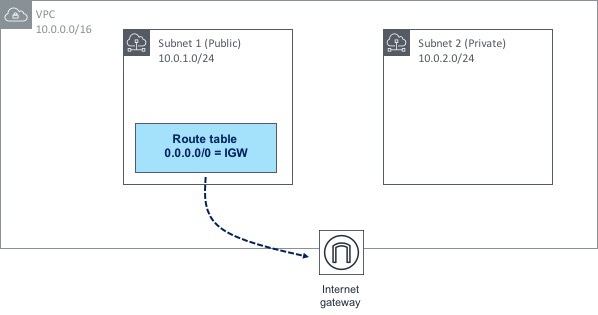 In the diagram above, we have three subnets within a VPC; two of those subnets are not explicitly associated with a route table, therefore they will use the main route table, which happens to have a route to the Internet through an IGW. Subnet 3 however has its own custom route table associated with it, which has a different 0.0.0.0/0 route towards a VPN gateway. By building and associating route tables in this way, you have a lot of control over how traffic is routed to and from your AWS environment. Let’s say I have some EC2 instances sitting within a subnet. I don’t want those instances to be directly accessible from the Internet (i.e. no-one should be able to SSH in or send an HTTP request to any of my instances). However, I do need those instances to be able to connect out to the Internet so they can pick up patches, updates and so on. This presents a problem - if I give each of my instances a public IP address, that means they can connect out to the Internet (great), but it also means that someone from the outside could easily connect in to my instances (not so great). OK, let’s step through this bit by bit. Within the VPC shown above, we have two subnets; one is public (i.e. it has a route to an Internet GW or IGW) and the other is private (it has no such route to an IGW). The private subnet has a number of EC2 instances contained within, all of which need outbound access to the Internet. The public subnet has a NAT Gateway provisioned within it - this NAT Gateway also has an Elastic IP address associated with it. We discussed Elastic IPs earlier in the post - there is no real difference here, apart from the fact that the EIP is associated with the NAT Gateway rather than an EC2 instance. As the public subnet (in which the NAT Gateway resides) has a route to the IGW, the NAT Gateway can therefore reach the Internet. 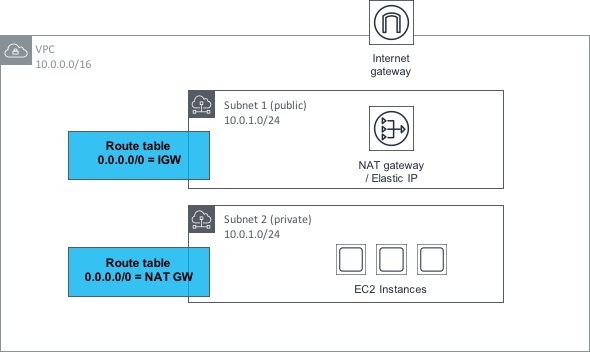 Now, if we look at the private subnet, we can see that it has a route table associated with it that contains a default (0.0.0.0/0) route towards the NAT Gateway in the public subnet. This means that if the EC2 instances make a request outbound to the Internet, the request gets routed through the NAT Gateway and out to the Internet through the public subnet. However, there is no possible method for connections to be made inbound from the Internet to the EC2 instances. Load balancing is nothing new - it’s been around for many years in many types of environment. Load balancing gives you the ability to distribute traffic across similarly configured instances or other types of service. If for example, you have a web server farm consisting of a number of virtual machines / instances, load balancing will allow you to distribute traffic across these instances in a relatively even manner. Load balancing also allows you to make more intelligent decisions about where to send that traffic (for example, the failure of a single instance should mean that instance is removed from the farm of machines that the load balancer is sending traffic to, typically based on some kind of ‘health check’ functionality). Classic Load Balancer: This is the original load balancer available from AWS - it is now considered a ‘previous generation’ load balancer and although it is still in widespread use, users should be encouraged to use one of the new generation load balancers (see below) instead. Network Load Balancer: The NLB functions at layer 4 of the Open Systems Interconnection (OSI) model. This means that it load balances traffic based primarily on information at the TCP layer - although as of January 2019, it does now also support SSL / TLS termination. Application Load Balancer: The ALB works at layer 7 of the OSI model (or the application layer). This means that it can be used for more advanced functionality, such as SSL / TLS termination, host or path based routing as well as support for multiple applications running on the same EC2 instance. A Listener - this is essentially a rule that says ‘look at connection requests from clients on this specific port’. This rule then says ‘forward this request to one or more target groups’. Target Group - the target group is a list of targets, such as EC2 instances or IP addresses that the requests will be forwarded to. So in our example, we have a listener set up to look at requests on TCP port 80 and then forward those requests to a target group called Web, which contains three instances. As long the three instances are healthy, requests will be forwarded to them. Note that the concept of listeners and target groups is common to both NLBs and ALBs. One other thing to also mention is that load balancers can operate as either internal or Internet facing - load balancers that are designated as internal are for use by other hosts and devices within an AWS VPC and will not be accessible by clients on the Internet. Finally, load balancers are availability zone (AZ) aware, so instances can be distributed across AZs and the load balancer will deliver traffic to them. In this simple example, I’ve configured the security group to allow HTTP and SSH access from any source (0.0.0.0/0). In reality, you would ideally lock this down to specific IP addresses rather than allowing SSH from the entire Internet, but you get the idea. One important point about security groups is that they are stateful. To understand what that means, think about an entry in a security group that allows traffic outbound from an EC2 instance. What about the return traffic back to that instance - is that allowed or denied? Because the security group is stateful, it automatically allows the return traffic back in - you don’t have to configure an entry yourself to allow that traffic. OK, so you’ve deployed a couple of VPCs - perhaps you have a different application deployed into each one, or maybe you have just split the app up and deployed it across multiple VPCs for more control. Now though, you’ve realised that actually there does need to be some communication between the VPCs you’ve deployed. Can it be done? Maybe you’ll have to route traffic from one VPC out to the Internet and back in to the other VPC? Well, that’s not going to be necessary, because there is a simple way to do this - VPC Peering. 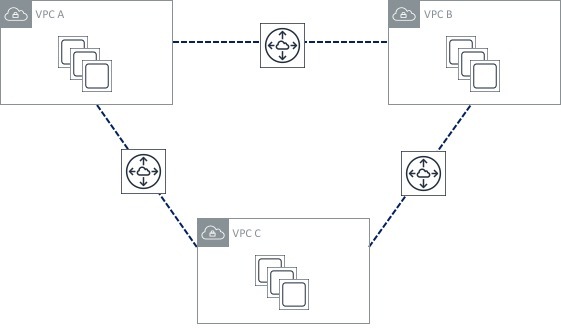 VPC peering does exactly what you’d expect it to do - it allows you to peer two VPCs together in order for traffic to flow between them. The two VPCs could both be in the same AWS account, or they could be in two different accounts. You can even peer VPCs that reside in different AWS regions. Set up routes that point to the ‘opposite’ VPC via the peering connection. In the above diagram, a VPC Peering connection has been set up between VPC A and VPC B. VPC Peerings are always named pcx- followed by a number, so in this case our connection is called pcx-11112222. In order to set this connection up, one side creates a request. To activate the VPC Peering, the request must be accepted by the other side (i.e. the owner of the other VPC). But just having the peering in place doesn’t mean traffic will flow between the VPCs. 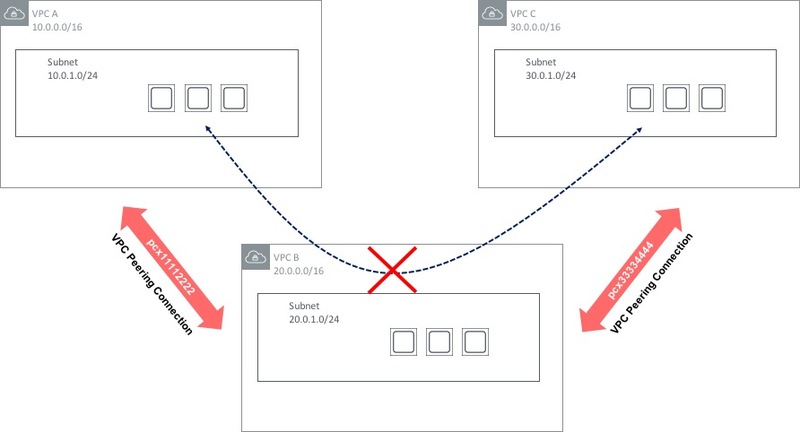 To allow communication, a route is needed within each VPC that points to the address range of the opposite VPC and routes via the pcx-xxxxxxxx connection. There are a couple of restrictions to be aware of with VPC Peerings. Firstly, it won’t work if you have overlapping CIDR ranges within the VPCs. So for example, if both VPCs you wish to connect have a CIDR range of 172.168.0.0/16, the peering won’t work. 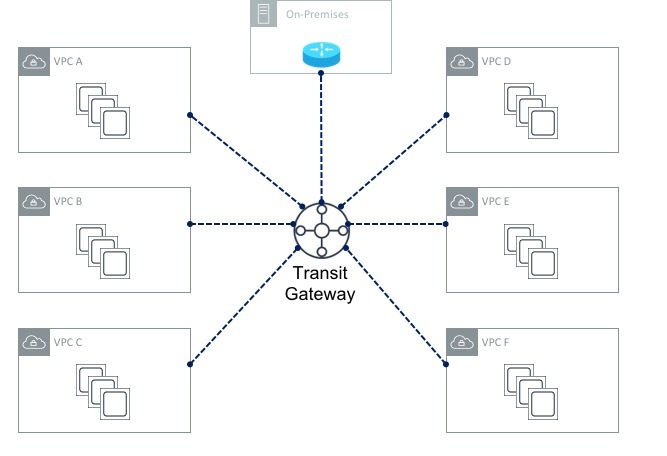 There are some ways around this - the Transit VPC design has been around for some time and uses a 3rd party network appliance (such as a Cisco CSR router running in the cloud) to provide ‘hub and spoke’ type routing between multiple VPCs. This design does have a few limitations however (such as limited bandwidth compared to VPC Peering), so this design pattern is likely to be superseded in many cases by a feature called Transit Gateway, which was announced at re:Invent 2018. Transit Gateway is a major step forward in the area of VPC connectivity, so let’s take a look at how it works. Not too bad, right? Three VPC peering connections isn’t too much to manage. Now though, I’ve decided to add two more VPCs to my environment. What does my peering topology look like now? Oh dear! The number of peerings I have has increased significantly, which looks much more difficult to manage. Obviously this problem is going to get worse as I add more VPCs to my environment. The other issue here is that it becomes difficult to scale - there are limits on resources such as VPC peerings and routes that will probably prevent me from scaling this environment significantly. Previously, I could get around this by using the “transit VPC” design I mentioned in the section above, but that has its own limitations and drawbacks. In this example, the TGW route table has routes for both VPC A and VPC B (it may also have routes for the rest of the VPCs, but I’ve not shown those to save space). These routes have been propagated (i.e. they didn’t have to be configured manually). Now if you look at the route table for VPC A, you can see that it has a route pointing to VPC B via the TGW. This route had to be configured manually (it was not propagated). The same goes for VPC B. Also shown in the above diagrams is a connection to an on-premises data centre. Before Transit Gateway was available, configuring VPN connections in a multi-VPC setup was sometimes difficult - it was necessary to configure a VPN Gateway (VGW) for each of the VPCs you had in place. 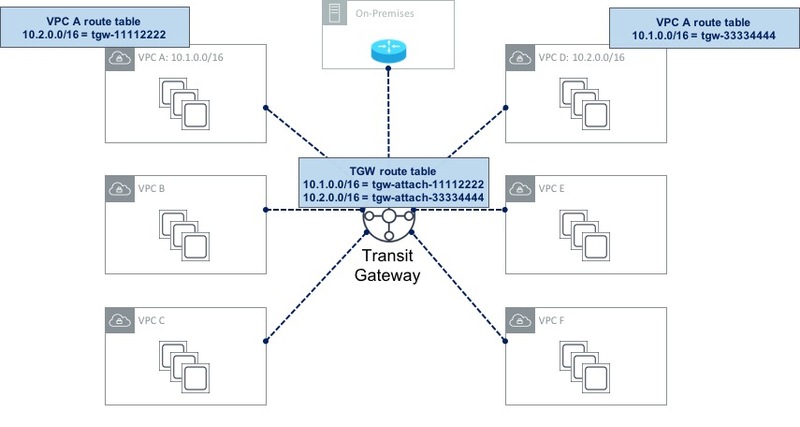 With a Transit Gateway, you can configure a single VPN connection from the TGW to your on-premises data centre which can be shared by each of the attached VPCs. You can even configure multiple VPN connections from the TGW and traffic will be distributed over them to provide higher bandwidth (using equal cost multi-pathing). Finally, it’s also possible to configure multiple route tables on a Transit Gateway in order to provide a level of separation in the network. This is very similar to the VRF (Virtual Routing & Forwarding) capability that most traditional routers have. 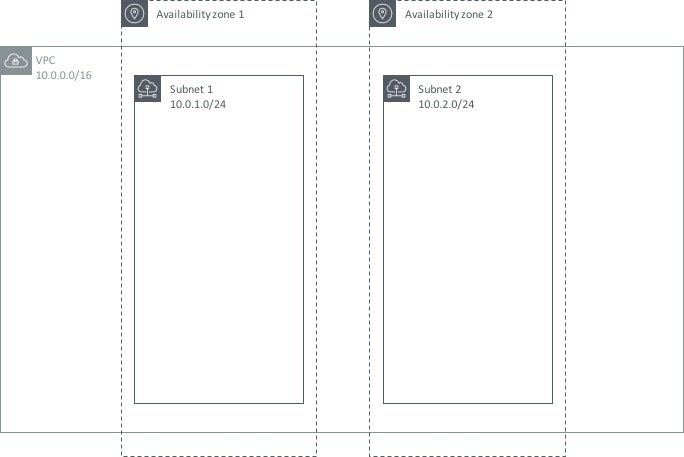 As an example, you could connect each of the six VPCs shown above to a single TGW, but specify that VPCs A and B used the first route table (thereby allowing connectivity between them), while the rest of the VPCs use a completely separate route table. VPCs A and B would essentially be in their own network environment, while VPCs C, D, E and F would reside in a completely independent, isolated network with no connectivity to VPCs A and B. Think about a regular VPC with some EC2 instances residing within. Then imagine that those EC2 instances require connectivity to one or more AWS services (CloudWatch, SNS, etc) - for example, the EC2 instance might need to download some files from S3. What path does that traffic take? Under normal circumstances, that traffic will take the path over the public Internet; remember, S3, CloudWatch and other services are public services, which means that they are accessible via the Internet, or Direct Connect public VIF, etc. This however might be a problem for some organisations - having their traffic leave the AWS network and on to the public Internet might not be all that appealing for some security conscious customers. VPC Endpoints and PrivateLink are designed to alleviate these concerns by allowing users to create private connections between their VPCs and AWS services, without the need for Internet Gateways, NAT and so on. 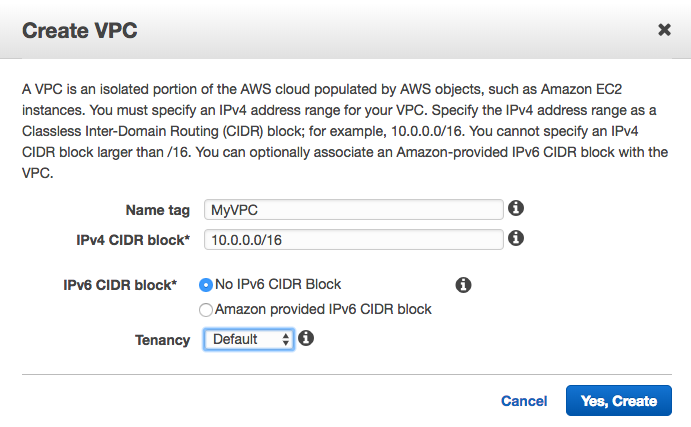 In the above example, we have a single VPC containing a number of EC2 instances. Those instances want to access the AWS SNS service privately (i.e. not via the Internet). To achieve this, we create an interface endpoint inside our VPC that points towards the SNS service. What this actually does is creates a network interface (ENI) inside our VPC with a private IP address. That means that our EC2 instances are able to access the SNS service using the private IP inside the VPC, which results in the traffic never leaving the AWS network. You also have the option of creating an ENI in multiple subnets / availability zones for high availability. One thing to be aware of is that there are a couple of services - S3 and Dynamo DB - that work in a slightly different way. These services use something called gateway endpoints - instead of creating an ENI inside the ‘consumer’ VPC, a gateway endpoint provides a target that you can route to. So in this case, you need to add a route to your routing table to S3 via the gateway endpoint. VPC endpoints are a great feature, but there’s even better news - it’s also possible to create endpoints that point to your own services - i.e, not just the AWS services that we all know and love. Let’s look at an example. Here, we have two VPCs - one acts as the ‘consumer’ (i.e. it contains instances that will connect to the service) and the other is the ‘provider’ (it contains the service that we want to give our consumers access to. In order to set this up, we first need to configure a Network Load Balancer in front of our service in the provider VPC. This will load balance traffic across the instances that make up our service. Now that we have that in place, the next thing to do is to create an Endpoint Service. The Endpoint Service makes your service available to other VPCs through an endpoint. 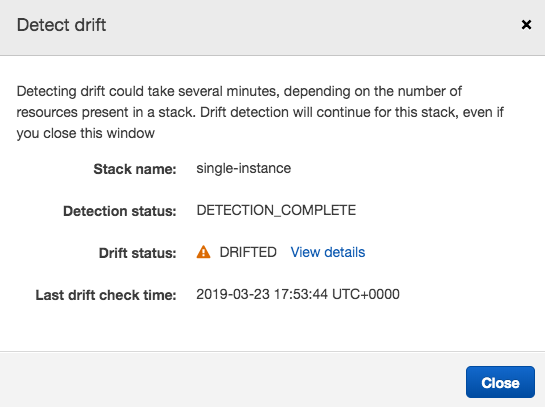 Finally, we create an endpoint (similar to what we did in the AWS service use case) that points to the Endpoint Service that we just created. This enables private communication between the instances in the consumer VPC and the service that sits in the provider VPC. Some might ask at this point: why not just enable VPC peering between the two VPCs? That would certainly be an option - the difference is that VPC peering enables full network connectivity between the two VPCs, while VPC Endpoints enable connectivity between services. In other words, with VPC peering, you are enabling fairly broad access, while with Endpoints you are allowing only specific connectivity between the services that you want. The ‘default’ method of connectivity into the AWS cloud environment is the Internet. This works just fine for many people, but equally, there are organisations who need to be sure that traffic to and from AWS is ‘private’ (i.e. not traversing the Internet). 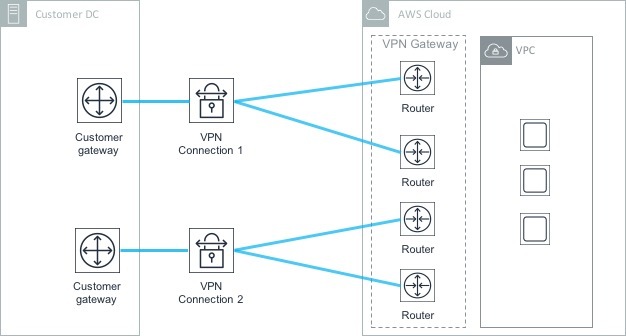 To satisfy this requirement, there are two main options: VPN connectivity (covered later in this post) and AWS Direct Connect. Direct Connect is a private, dedicated line between AWS and a customer’s on-premises environment - Direct Connect provides a high bandwidth connection with predictable latency. 1Gbps and 10Gbps options are available, with lower connection speeds (50Mbps, 100Mbps, etc) available from AWS partners offering Direct Connect services. A customer connects to AWS via Direct Connect at one of the available locations (more details here). It’s also possible to extend connectivity from a Direct Connection location to a customer’s location - this can be done with the help of an AWS partner. As you can see in the diagram above, a private VIF should be configured for connectivity into a VPC, whereas a public VIF needs to be configured for connectivity into services with a public end point (such as S3, RDS, ECS, etc). In order for traffic to flow across a Direct Connect circuit, the correct routing information needs to be present at both the AWS and customer ends. To achieve this, the Border Gateway Protocol (BGP) is used - BGP is a widely supported routing protocol on most customer routers. From the AWS end, VPC CIDR ranges and / or public IP prefixes are advertised using BGP to the customer’s router. 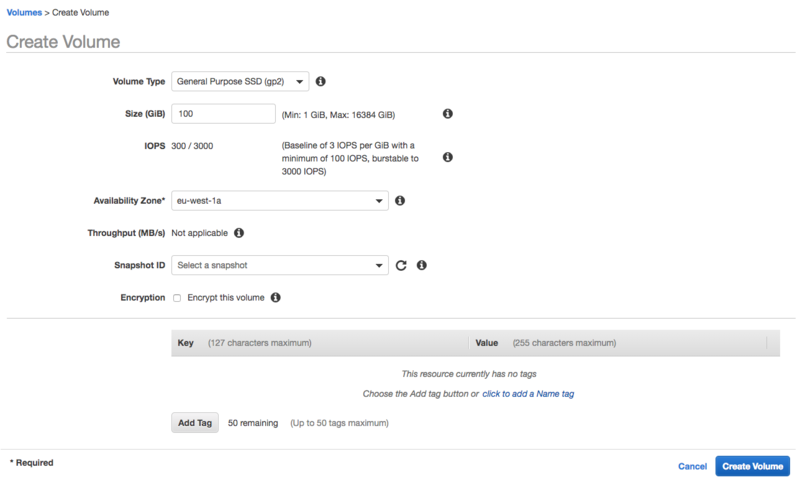 From the customer end, customer routes (or a default route) can be advertised to AWS. The other option for providing ‘private’ connectivity between an on-premises environment and AWS is to use a Managed VPN Connection. A VPN connection allows the user to configure a private secure tunnel using IPSec, typically over the public Internet. VPN connections are limited to 1.25Gbps, so don’t provide the same level of performance as a Direct Connect circuit. VPN connections use two main components for the configuration: a Virtual Private Gateway and a Customer Gateway. The Virtual Private Gateway (or VGW for short) is the termination point for the VPN connection within a VPC. A VGW has a BGP Autonomous System (AS) number associated with it - this can be an AWS assigned number, or a customer number that you choose. The Customer Gateway is a resource that represents the customer side of the VPN connection (e.g. the “on-premises” side). When you configure a Customer Gateway, you specify the IP address of the VPN router within the on-premises environment, as well as the AS number of the on-premises side if using dynamic routing. One thing to bear in mind when setting up VPN connections is that each connection uses two tunnels for redundancy purposes. This ensures that connectivity remains should an underlying issue affect one of the VGWs. However, having two tunnels doesn’t provide protection against the failure of the customer gateway (as both tunnels terminate on the same CG). To protect against the failure of a single Customer Gateway, it’s possible to set up a separate VPN connection and terminate this on a different CG at the on-premises end. In the above diagram, there are four tunnels in total - two associated with the first Customer Gateway and another two associated with the second. In this scenario, if the first CG fails, the second is still available to handle the VPN connectivity to AWS. OK, this has been a long post so I think I’ll stop there. Clearly there’s a lot to networking in AWS - hopefully this post has given you an idea of how things work. In the next post, we’ll dive into storage in AWS.